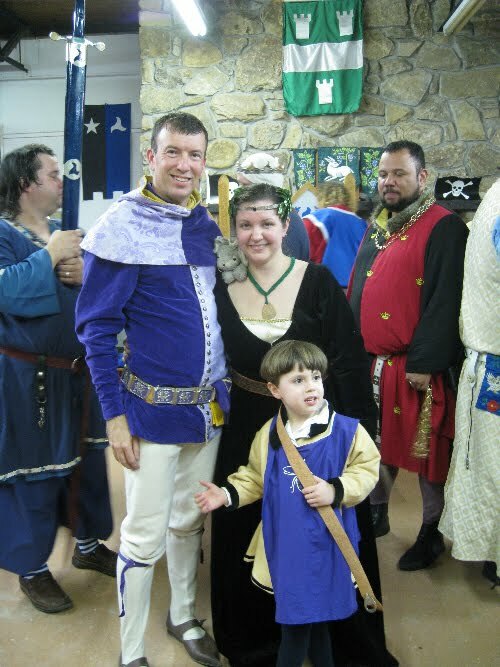 Since there is no standard ceremony for the elevation to the Order of the Laurel in the Kingdom of Trimaris, Master Terafan and I enjoyed cooking up our own version based on our love for medieval pageantry, "properness" and a dash of court 'schtick'. What follows is the transcript of my ceremony. The elevation ceremony in court was preceded by a vigil the night before. Herald: The strength and stability of the Kingdom lie in three virtues of its people: service, chivalry, and artistic endeavours - for if any of these are lacking, the Kingdom fails. The artists and artisans of the Kingdom glorify it with their work, and the teaching of their skills brings to it the Light of Learning. Their Majesties command the presence of the Masters and Mistresses of the laurel. Herald: It has long been recognised that there are those among us who are much deserving of high honour, but who, by reason of the nature and direction of their services and achievement, come not to the glory of warrior or throne, yet without whom Our land would not be half so blest. Therefore was created the Order of the Laurel, to recognize those who, possessing all the other skills, virtues and attributes appropriate to members of the Peerage, shall also have distinguished themselves by their outstanding achievement in the Arts and Sciences. And the symbols of this Order are a medallion bearing a laurel wreath, for the chaplet of laurel has long been acknowledged as a mark of superior achievement. And this Order ranks in precedence with the Chivalry and the Order of the Pelican. It carries with it a Patent of Arms. Mistress Melessee: Your Majesties, having consulted with the Order, is it Your desire to increase our numbers at this time? King: It is. Please bring the candidate forward. Mistress Melessee: My liege, it is my privilege, to present Maeva Eriksdottir, that she may be made a member of our order. King: If you are apprenticed to any member of this Order, name him or her now. Maeva: Your Majesty, I am apprenticed to Master Rhys Terafan Greydragon. 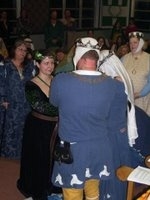 King: Master Terafan, We are minded to admit your apprenticeto the Order of the Laurel. Will you now release her from your service and release her from whatever fealty exists between you? Master Terafan: No, Your Majesties! I have travelled long and hard from Ansteorra to stop this madness. She is not yet ready for this accolade. Queen: Good master, we know that well and faithfully have you taught and diligently have you instructed Maeva, and well does it show in her deeds and achievements. The peers of our realm might not agree with you. Is there a member of the Order of the Laurel to speak for Maeva? King: Is there a Member of the Chivalry to attest to Maeva’s Honor? Queen: Is there a member of the Pelican to attest to Maeva’s service? King: Is there a member of the Order of the Rose to speak for Maeva’s nobility and courtesy? Queen: Is there a member of the populace who would attest to Maeva’s qualities as a Peer. Martine, Milica and Darlene representing the populace: Maeva, know that to be a Peer is to hold a sacred trust; and that the obligations will demand your efforts every moment of your life. · A Peer must seek excellence in all endeavours, not for their own good, but for the good of others. · A Peer must always seek Justice, truth tempered with mercy. · A Peer must remain Loyal to the people and the ideals she chooses to live by. · A Peer must always defend their Kingdom, their family and those who depend upon them. · A Peer must have the courage to sacrifice for the precepts and people they value. · A Peer must have faith in their beliefs, while never diminishing the beliefs of another. · A Peer values the contributions of others and does not boast of their own accomplishments. · A Peer must be generous as far as their resources allow. · A Peer recognizes that true nobility arises from the journey, not the destination. King: Maeva indeed emulates all these as sincerely as possible, not for her personal gain but because it is right. She does not restrict her exploration to a small world, but seeks to infuse every aspect of her life with these qualities. Should she succeed in even a tiny measure, then she will be well remembered for her quality and virtue. King turns to the sponsor. King: Do you, Mistress Melessee, and the other members of your order affirm her worthiness for this high honour, accepting her as your peer in artistic and scientific endeavour and the other attributes of peerage? King: My Lady Queen, is it Your judgment, that the candidate fullfills all the requirements of peerage? Queen: It is my Lord. All who know Maeva find her to be a gentleperson in all respects. King: Master Terafan, having now heard the peers of our kingdom and knowing Our mind to elevate Maeva to the Order of the Laurel, do you now agree and will you release her from your service and from whatever fealty exists between you? Master Terafan: Honourable Lady Maeva, well pleased am I with your labours and I now release you from my service and the fealty we have had between us. Maeva: It has been my honour and pleasure to learn all that you could teach me. I release you, Master Terafan, from all of the responsibilities and duties you took upon yourself when I became your apprentice. I here return this token of my bond to you. King: Maeva, right mindful of your achievement and service to Our land, and responsive to the wishes of your peers, We are minded to create you a Mistress of the Laurel. Will you accept from Us this honour and this badge of your achievement? Maeva: I will, Your Majesty. King: Make known Our Royal will. Herald reads scroll, hands it to King. King shows it to the populace and then hands it to a retainer. King receives the medallion from Master Terafan who will relate the history of the medallion. King places medallion around Maeva’s neck, as he says the following. King: Maeva, take from Our hands this token of your achievement, Our esteem, and as a symbol of that nobility to which your own labours, as much as Our recognition, have raised you. Henceforth be Mistress Maeva. Queen: Let the new Mistress be vested as befits her new rank. A chaplet of laurel leaves is placed on the new peer's head and a Laurel's cloak is placed around the peer's shoulders, while the herald says the following. Herald: From ancient times, the chaplet of laurel has been placed on the heads of those worthy of special honour and recognition. The cloak is the outward sign of the Laurel's new status as a peer of the realm. King: Mistress Maeva, is it your wish to swear fealty to us at this time? King receives Sword of State. Laurel places his hands on the sword, King and Queen place their hands upon Laurel's hands. Herald: Will you hold Thorsten and Zephyrine your rightful King and Queen, right until the end of Their lawful reign, and support Their royal might and justice? Herald: Will you seek to give the Crown such counsel which is to the benefit of Them and Their Realm, and support Them in upholding the laws and fulfilling Their coronation oath? Herald: And will you keep secret such matters as the Crown wants to keep in confidence, and not divulge such secrets that could harm Their Realm? Herald: Will you seek to ever enrich the kingdom with your talents and abilities, to promote the diverse arts, and continue the instruction of your dependents, all to increase the glory of Trimaris? Queen: All this do we hear, nor fail to remember. And We, in turn, promise to reward that which is given and grant you and your household all the rights and privileges of old, and to protect you with the Law of the Realm. So say We Zephyrine, Regina.